This genus is accepted, and is native to Queensland, Northern Territory and Western Australia.. The tribe is geographically disjunct, comprising a paraphyletic group of tropical American genera (Cyclolobium, Poecilanthe, Harpalyce and Brongniartia), and nested within it, a monophyletic group of Australian genera (Templetonia, Hovea, Cristonia, Thinicola and Lamprolobium). The Australian genus Plagiocarpus appears to be more closely related to the neotropical Brongniartia than to the other Australian genera. Arroyo (1981) considered the tribe to comprise the two genera Brongniartia and Harpalyce, both from the Neotropics, so that the concept of Brongniartieae has expanded considerably. The Australian Templetonia group was transferred on the basis of a cladistic analysis of morphology (Crisp & Weston, 1987), and recently two new genera have been described in this group, Cristonia and Thinicola (Ross, 2001a). Two more neotropical genera (Cyclolobium and Poecilanthe) have been transferred into the tribe on the evidence of DNA sequences and phytochemistry (Crisp et al., 2000; Hu et al., 2002). A putative new genus from Bahia, Brazil is under study by Queiroz, Lewis and Wojciechowski. Current molecular data indicate its sister relationships are to Harpalyce and Poecilanthe, but formal description of the new genus awaits further analysis. Polhill (1994) placed Brongniartieae next to Bossiaeeae, partly because Crisp & Weston (1987) removed the Australian Templetonia group from the latter and placed it in Brongniartieae. Polhill (l.c. 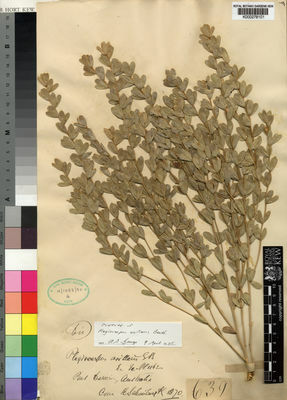 ), however, noted that their very different alkaloid profiles suggested Brongniartieae and the Templetonia group had an affinity to the genistoid tribes, while tribe Bossiaeeae was more closely related to Mirbelieae, Hypocalyptus (now in Hypocalypteae), a group of Old World tropical tribes (including Indigofereae, Millettieae and Phaseoleae) and the Hologalegina group of tribes. Recent phylogenetic analyses, especially those using DNA sequences (e.g., Crisp et al., 2000; Doyle et al., 2000; Hu, 2000; Pennington et al., 2000a; Hu et al., 2000; 2002; Wojciechowski et al., 2004) support a placement of Brongniartieae either next to, or within, the main clade of genistoid tribes, which includes Sophoreae sens. lat., Euchresteae, Thermopsideae, Podalyrieae, Crotalarieae and Genisteae. Pennington et al. (2001), Kajita et al. (2001) and Wink & Mohamed (2003) place Brongniartieae sister to a clade including Sophoreae sens. strict., Thermopsideae, Podalyrieae, Crotalarieae and Genisteae. The tribe as treated here comprises 10 genera (not including the putative new genus) and c. 152 species (Fig. 32). Thompson, I.R. (2010). A revision of Plagiocarpus (Fabaceae: Brongniartieae) Muelleria 28: 40-52.